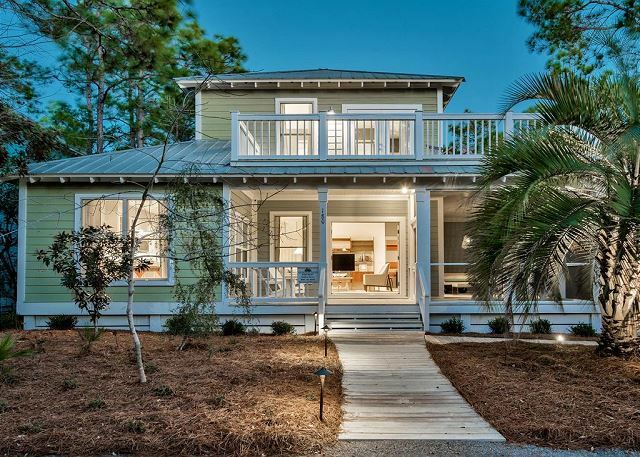 Dolphin Dance is a beautifully renovated mission style beach house in the quaint “Grove by the Sea” community along coveted 30A. Inspired by small-town beach life on a scenic highway that meanders along Florida’s Gulf Coast where it’s not just a line on the map, but a lifestyle. 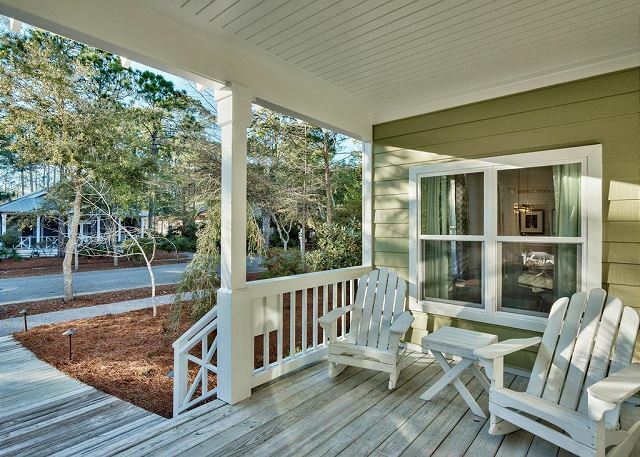 Nestled just 1,000 feet from the uncrowded, white sugar-sand Seagrove beaches, you’ll enjoy walking or biking everywhere. 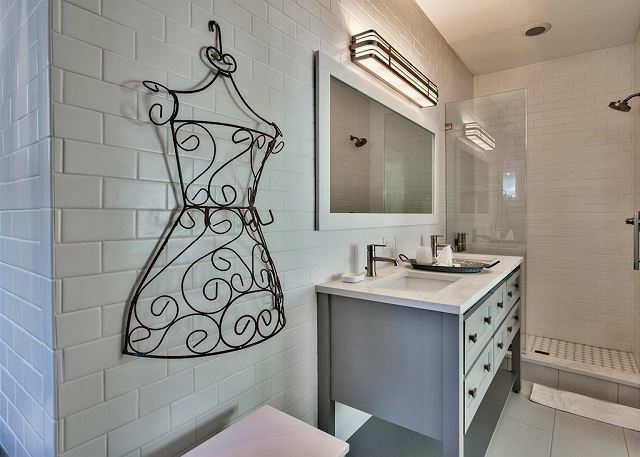 The professional Designer/Engineer owners attended to every detail in this unique, upscale 1,700 square foot gem. 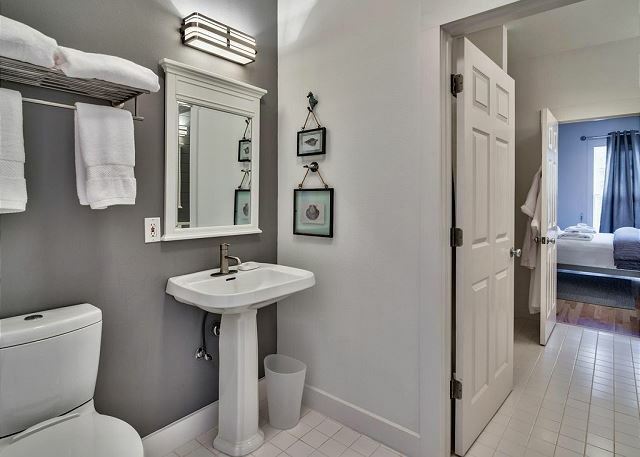 Just imagine casual elegance with two private Cal-King Master Suites, each with a connected bath- one on the main floor and one on the second floor. 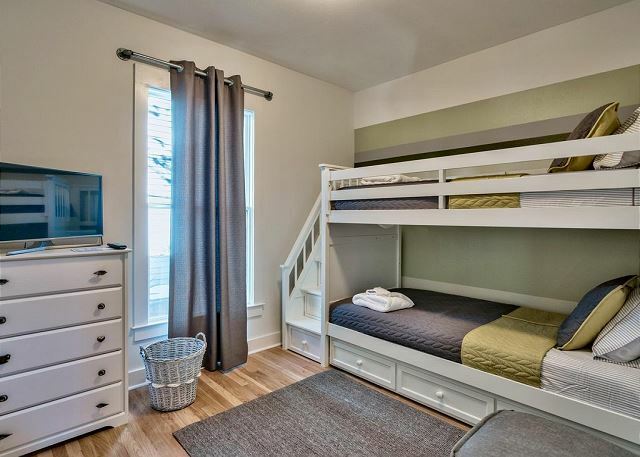 This 3 bedroom, 3 bath vacation rental sleeps 7 comfortably- including up to 3 children with their own room, adorned by twin bunk beds and a trundle. 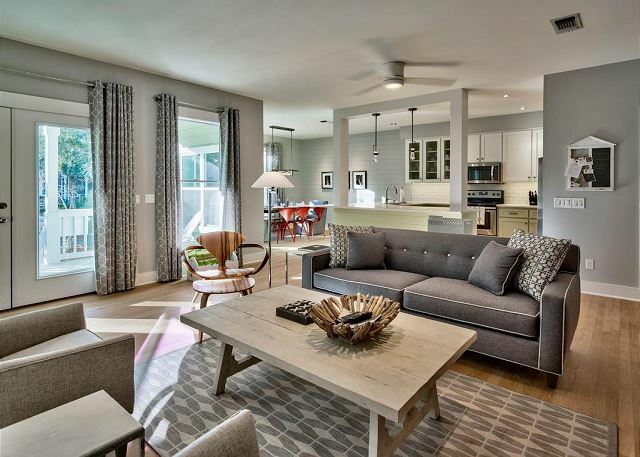 Great conversations, laughter and enjoyment will be had in the open concept living/dining/kitchen areas with 4 enchanting outdoor spaces for reading, sunning, sipping morning coffee or enjoying a cocktail. Out the living area and down the front steps guests are led to a spacious outdoor community pool directly across the street and tennis courts just a block down. 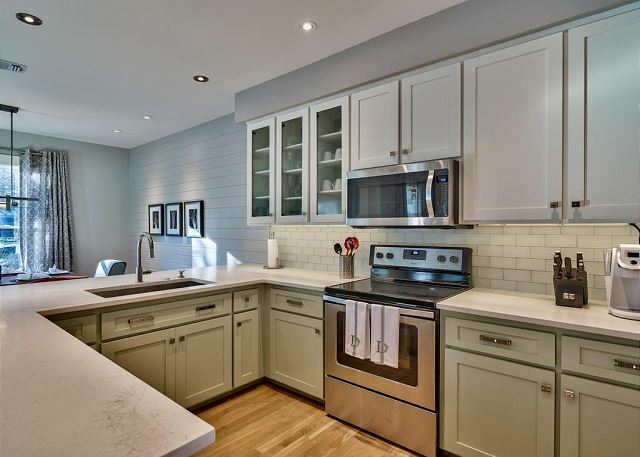 From the distinct, inviting interior, to the numerous personal touches and amenities, this home encompasses all the luxurious features you would desire in the ideal beach get-away. 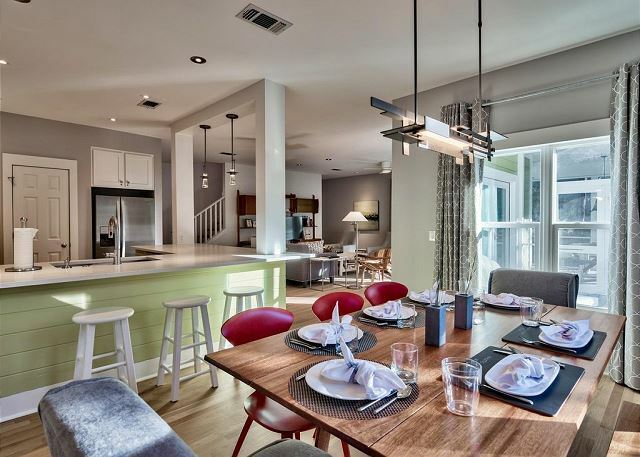 Close to Seaside, beach access, upscale restaurants, local diners, boutique shopping, food trucks, bike paths and more. 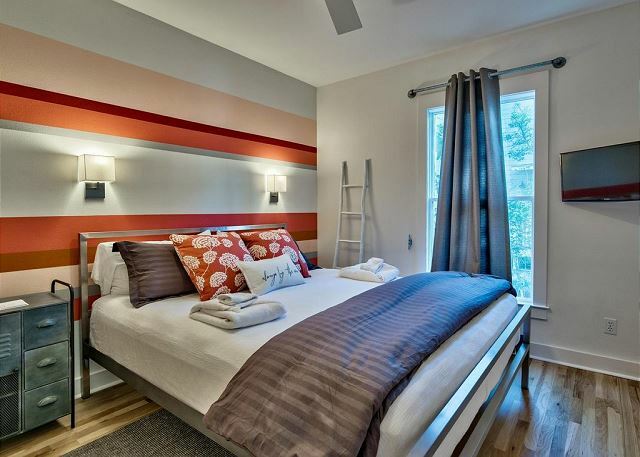 Perfect for vacationing couples, small families and extended families. Very limited rental availability, won’t last long, book today. This beach rental instantly felt like home. WE almost didn't want to leave to even enjoy the beach. It was spotless. 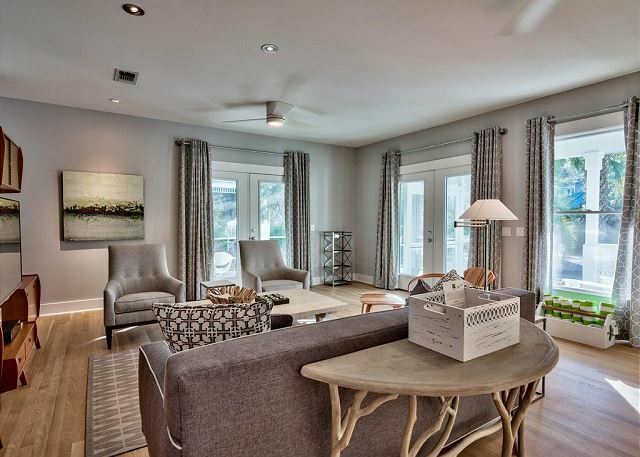 Furnished with so many extras we couldn't believe. Did NOT want to leave. We loved our week at Dolphin Dance! The location is so wonderful. We had a baby and a toddler in the group and it was a short, easy walk to beach. The beach access was right at the end of the street and you didn't have to get out in the 30-A traffic to go to the beach. To top it off, the pool was diagonally across from the house and right on our way home from the beach. The house was well decorated and was a great floor plan. Our family of 7 fit perfectly. The kitchen was well supplied. I would suggest a traditional coffee maker be added for the real coffee drinkers (not just a Kurig). Publix and the fish market were within a 5 minute drive and great restaurants in both directions on 30-A. I would definitely return and would recommend to others! We enjoyed our stay . Actually preferred over Seaside due to traffic and quiet! Thank you for taking the time to submit your review! This is a truly fantastic community isn't it! Dolphin Dance is so close to the action but yet tucked away where you can experience the tranquility of the area. 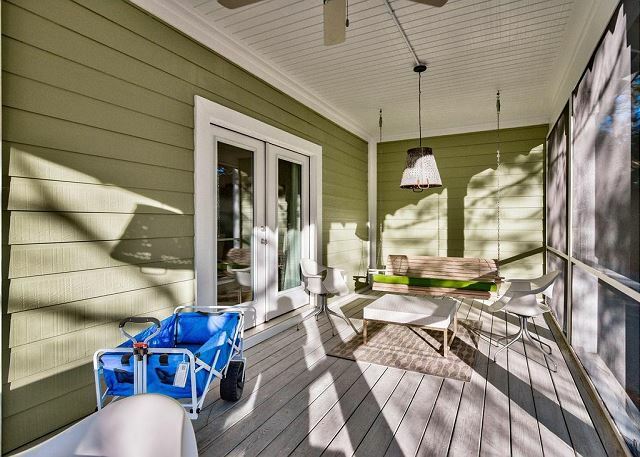 Especially in this home - the screened in porch allows you to enjoy the evening while the balcony off the upstairs Master suite allows a quiet area to sip your coffee before the rush begins! 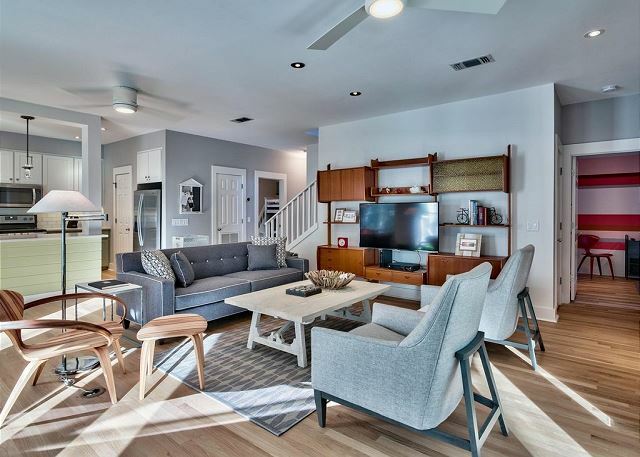 The interior is amazing as well - the owner has put much thought into the design and comforts of this home for your enjoyment! Come enjoy it today - you owe it to yourself to experience the beauty of 30A! We arrived after dark, unpacked and opened a bottle of wine. Both the living room and the screened porch are great places to relax, and the luxurious Cal-king bed did not disappoint! The next day we were ready for action, and walking the beautiful and quiet white sand beach suited us just fine. We visited the nearby Publix for provisions and enjoyed the well-appointed kitchen - it was easy to feel right at home. We also took the first of several bike rides, a really nice way to see the communities along 30A! When our daughter, son-in-law,, and five year old granddaughter arrived, we were ready to explore the areas parks and beaches! Our daughter exclaimed, This is like a luxury hotel, so getting them out the door took a little coaxing. Once we did, we particularly enjoyed Grayson Beach State Park, walking along the dunes at Deer Lake State Park, and exploring the historical structures and nature trails at Camp Helen State Park. Though we particularly enjoyed buying fresh fish to grill at home, we did love the Seagrove Village Market Cafe. Too bad the community pools arent heated - they were a bit too cold for swimming while we were there. All in all, a great experience! Thank you for your glowing review of Dolphin Dance! 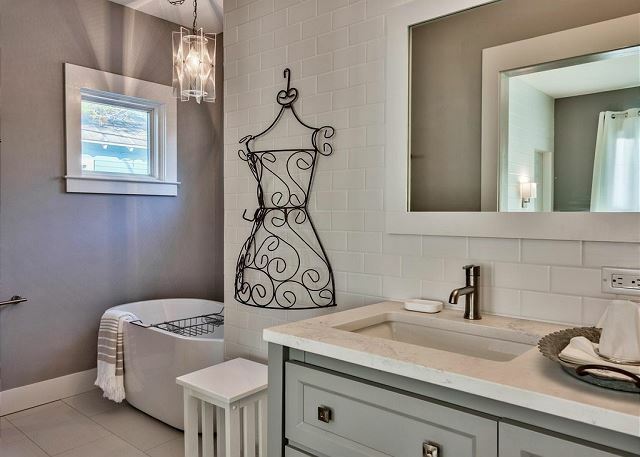 This home truly is a gem - for all of the reasons you mentioned! 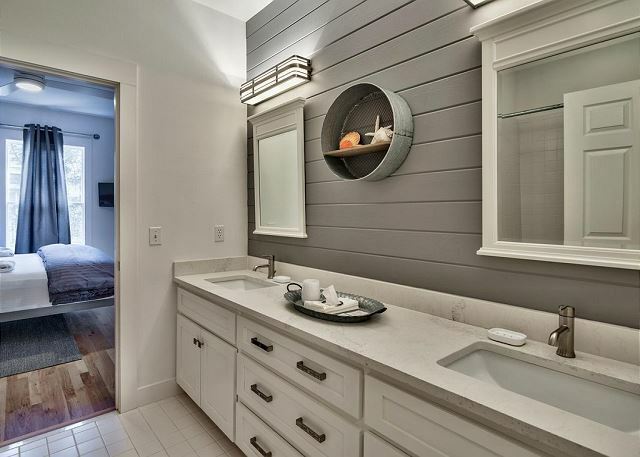 This beauty is tucked inside the wonderfully quaint neighborhood of Grove By The Sea - where you can ride your bikes, walk with your loved ones or just sit, relax and listen to the birds singing! 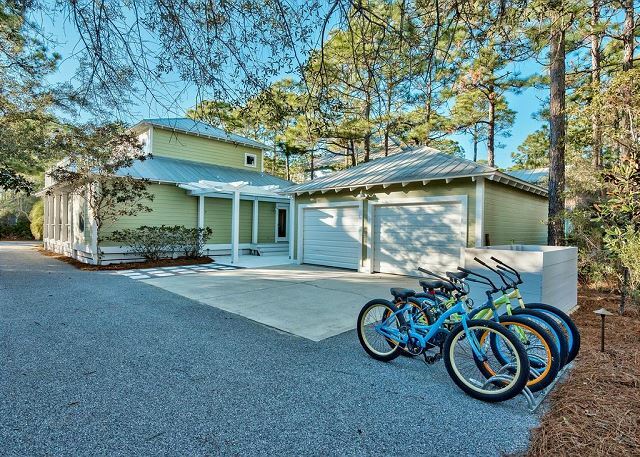 Just across from the beautiful community pool (which Mother Nature will have heated for us soon) and an easy walk across 30A to the beach you are never far from the water! Today is a great day to experience the cozy comfort of Dolphin Dance! this house made our trip even better! We go to seagrove every year for fall break. It's become our favorite time of year. We usually try a different house everytime we go, b/c there are so many to choose from. We look at location, size of home and comfort. We hit the jackpot this time! We loved the dcor, ALL the little extras, these owners thought of everything!! 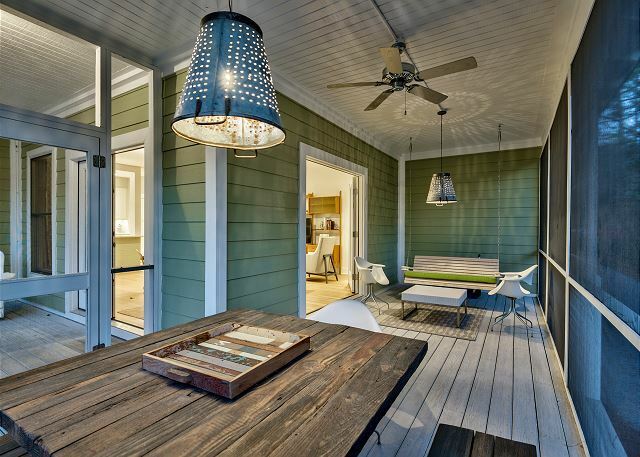 We loved the porch, the openness of the first floor and the master bedroom/bathroom was perfect. We will definitely come back to this house, it truly made our stay even better! Thank you for submitting your review - we are so happy you enjoyed your stay at Dolphin Dance! 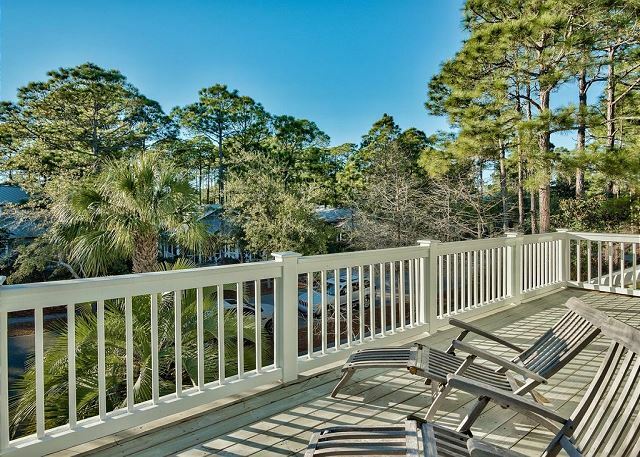 This is such a great property - the neighborhood is charming, the pool is right across the street and the beach is a short walk across 30A! 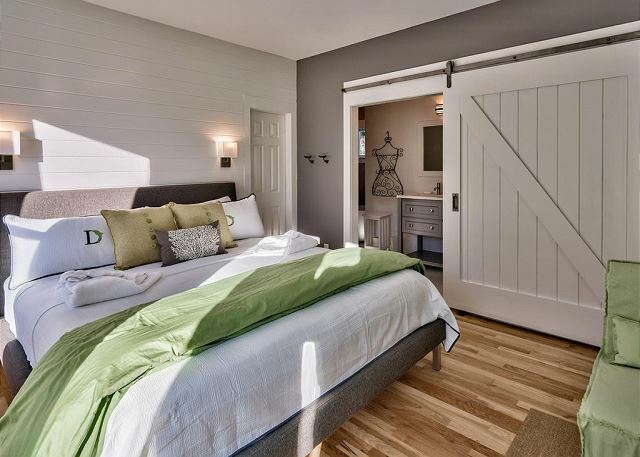 Not only is the location great but the property is truly a gem - the owners have been very thoughtful in the design as well as the amenities provided. They want you to have a 5 star experience and they work very hard to ensure your comfort and convenience! We do hope you will choose Dolphin Dance for your next visit to 30A - you owe it to yourself to have this experience! The house was outstanding. Extremely well provisioned and comfortable. We will come again.